In Blackjack Surrender, the dealer always stands on 17s. You can split any pair, but you cannot re-split unfortunately. Split aces take only one more card before you must stand. If one of your split aces gets dealt a 10 point card, you get just get 21 instead of blackjack. If you want to double down you certainly can, no matter what cards you have, and even after a split! It just costs 1x your initial bet. If you double down hen the dealer shows an ace, and the dealer gets blackjack, you lose both your bets. But if you double down when the dealer shows a 10 point card and the dealer gets blackjack, you get your double down bet back! Insurance is available if the dealer shows an ace. You can surrender early in this game, just after the dealer checks for blackjack. If you surrender, you lose half your bet and the round is over. Blackjack Surrender lets you wager anything from 1 to 300 USD/GBP/Euro. Strangely, the chips come in six sizes – 0.01, 0.10, 1, 5, 10, 25, and 100. Why there are two chips less than 1 credit, which is the minimum bet, is not clear! It does let you bet 132.26 if you like, or 1.01, or any other odd numbers. At any rate, that does not change things much. When you win (that’s the important bit! 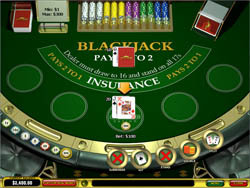 ), Blackjack pays at 3:2, a standard win at 1:1, and insurance pays at 2:1. Blackjack Surrender looks and plays fantastic. The graphics are completely photo realistic, from the plush velvety violet stools, to the shiny brass chip tray and the brass and plexi card shoes. The cards and chips are all subtly animated, and everything moves quickly and smoothly, so these flourishes add to the look of the game, but never get in the way of playing the game. As for gameplay, everything works great. The buttons come and go on the bottom of the screen, only appearing when they are needed. There are even optional warning messages for beginners – the game asks ‘are you sure?’ if you try to Hit on 17 or higher! This makes Blackjack Surrender a good game to learn with. Blackjack Surrender has a special winning hand called 7 Card Charlie. This is a hand with 7 cards in it that has not gone bust. This hand is good because beats all dealer hands except for blackjack, no matter what the count is! So if you find yourself in a strange streak of low cards, keep hitting. This hand doesn’t come up often, but it sure helps when it does! Blackjack Surrender is one of Playtech’s best blackjack games. It sticks with the standard rules and keeps the gameplay simple, all while giving you the oh-so-valuable early surrender option which lets you escape from a hand you are sure to lose with only half the losses of actually playing it. Lots of players like this option, and since it is an integral part of so many blackjack games, nobody thinks twice about it. So go ahead, try Blackjack Surrender today and start winning some money!